When city workers removed the stucco from the side of this building on Main Street, they were surprised to discover writing underneath it. Behind the scaffolding at the top left, you can see the words "After Every Meal," which is apparently part of a circta-1950 advertisement for Wrigley's gum. 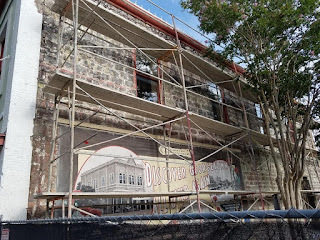 While it is very disappointing that we are losing the mural below that was painted on this building (it is still visible in this photo), it is neat that the building will have another piece of history showing on it.